Modern America’s inquisition might not wield torches and pitchforks, but they’re no less dangerous to freedom of thought than their medieval counterparts. 1. Yes, I believe that the risk of climate change is significant enough that we ought to take action now to reduce the possibility of future harm. 2. No, I do not believe that we should take any action now to prevent climate change. This is dangerous reasoning. For many on the Left, the question of global warming is already settled and therefore beyond debate; and anyone who questions the accepted narrative is a dangerous “climate denier” needlessly endangering humanity. Wheelan may phrase his “modest proposal” as a kind of inexpensive climate “insurance,” but the extreme costs of implementing such an agenda—such as the 2015 Paris Climate Accord—are very real. As Capital Research Center reports, abiding by the Accord could cost the United States nearly 400,000 jobs (200,000 of which from manufacturing), raise household energy prices by 13-20 percent, and cost the national economy $2.5 trillion by 2035. Scientific skepticism does not rule out the possibility of global warming; rather it seeks evidence before drawing up disastrous “solutions” to an ill-understood phenomenon. When science is politicized and people are smeared as “deniers” for merely questioning the shadowy status quo, freedom of thought and expression are smothered in the name of political correctness. 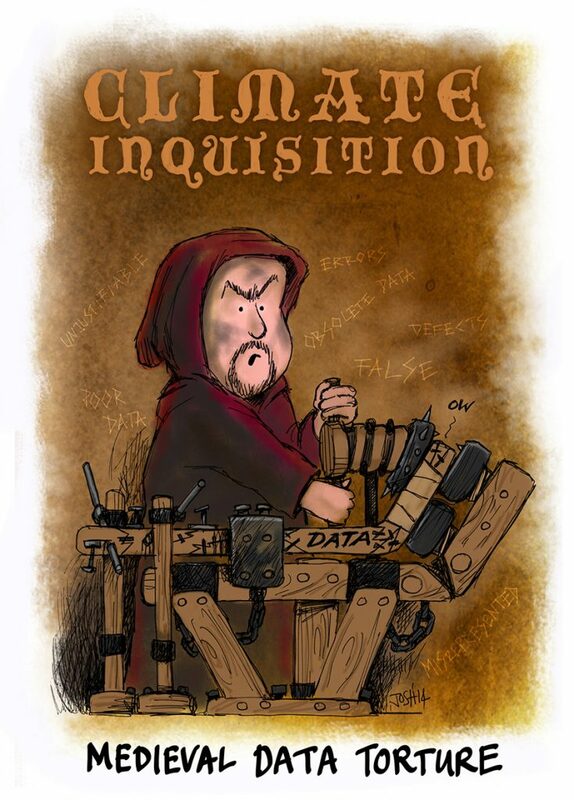 The result is a kind of climate change inquisition akin to the medieval institution infamous for testing and executing religious dissenters. These inquisitors grill candidates for public office even when the position they are being considered for is unrelated to climate issues. Senator Kamala Harris (D-California) interrogated CIA Director Mike Pompeo on his views regarding climate change as the cause of rising political instability during his confirmation process. Representative Jim Bridenstine, President Trump’s choice to direct NASA, has been branded a climate denier by the far-left group Climate Hawks Vote, a PAC that has environmental radical Bill McKibben and ex-communist Van Jones on its advisory board. Simply holding different views from these climate change inquisitors will earn you the epithet “denier” regardless of your actual beliefs. But there are worse consequences for so-called deniers, as when Obama era Attorney General Loretta Lynch hinted at “pursuing civil actions against so-called ‘climate change deniers.’” Lynch went so far as to refer the question of civil action “to the FBI to consider whether or not it meets the criteria for which we could take action.” Senator Sheldon Whitehouse (D-Rhode Island) urged Lynch to sue climate skeptics under the RICO act—a law created in 1970 to target organized crime syndicates like the Mafia. Whitehouse even urged the editorial boards of major newspapers to refrain from publishing “phony ‘opinion’ writing” pieces by climate skeptics—in other words, pieces that disagree with his immovable opinions. These inquisitors invariably claim that the devastating consequences of man-made climate change warrant immediate action, no matter how extreme; but for others the requirement to act stems from the belief that government should be empowered to restrict individual choice. If the government can gag anyone who disagrees with the state’s accepted position on climate change, who can stop it from deciding which car we can drive (if any), what food and essentials we may purchase, and—taken to the logical conclusion—what political opinions we can express? Using slick marketing techniques and impressive-sounding data points from self-styled experts, pseudo-scientific ideologues build a case for complete government control of our everyday decisions set against the backdrop of an impending crisis: global warming. They sell it with buzzwords like “responsible,” “moral,” and “sustainable.” And in case you get any funny ideas about questioning this supposedly settled science, there’s the ever-present threat of being smeared by future generations as a climate denier to silence dissent. But the science isn’t settled—a significant point considering the aforementioned economic costs of many proposed climate change “solutions.” A cursory glance shows that the scientific community is anything but in agreement about an issue they only began to study seriously in the 1960s. No one can prove what role humans have in the Earth’s changing climate—which is why debate and experimentation must be encouraged, not silenced. What is provable, however, is the number of times humans have gotten climate science wrong—such as the global cooling scare of the 1970s, when major media outlets and environmental activists declared with certainty that the Earth was rapidly entering a devastating ice age. Despite their claims to love and defend science, it’s all-too clear that many on the Left are simply political ideologues, ignorant of real climate science. In the wake of two hurricanes—Harvey and Irma—CNN journalist Jim Acosta falsely claimed that climate change has made storms more frequent and intense, despite any evidence suggesting this (prior to Harvey, the United States hadn’t experienced a major hurricane since 2005). 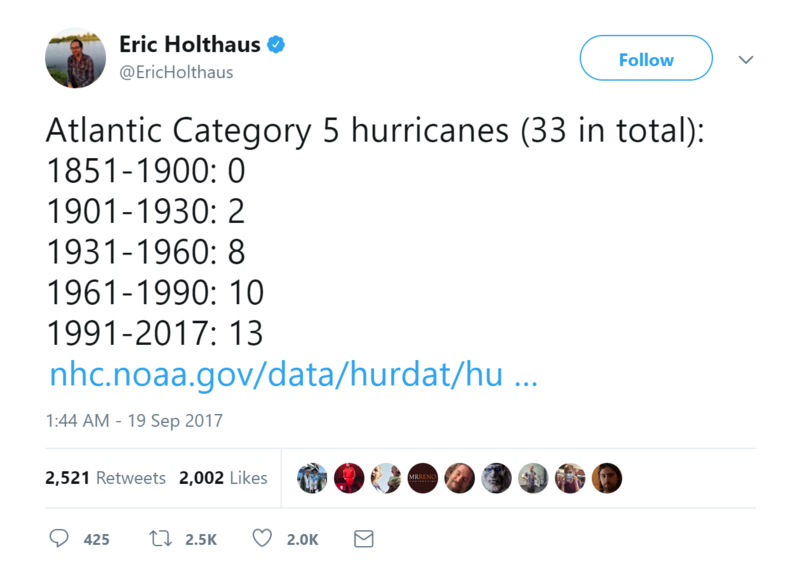 One Twitter user posted a timeline of Category 5 hurricanes using data going back to 1851 from the National Oceanic and Atmospheric Administration (NOAA) to wrongly imply that climate change was generating more intense storms. Of course, that system – the Saffir-Simpson scale – was invented in 1971, and didn’t see use until 1974; accurate hurricane tracking via satellites has existed since the 1980s, and tracking in general hardly existed before the 1960s. Claiming that zero Category 5 hurricanes happened in the period around 1851—before the invention of modern photography, the lightbulb, the diesel engine, the state of Washington, the discovery of islands in the south Pacific, the creation of NOAA and modern climate science—is asinine. “So should we have policies that penalize people for having extra kids in the developed world?” Nye asks. “I do think that we should at least consider it,” [Johns Hopkins University “ethicist” Travis] Rieder replies blandly. “‘At least consider it’ is, like, ‘Do it!’” Nye responds, a demonic glint in his eye. Scientists have a long way to go before they can develop a clear picture of the role humans play in the Earth’s ever-changing climate. That may take decades to advance, and may never be a truly settled science. But you can set your watch by the end-of-the-world lamentations; years from now they’ll still be making the doomsday rounds.